The Bible is a holy book that deserves to be taken care of. For that reason, our leather Bible bag is designed to withstand time. While the Bible bag was originally designed to keep the scripture pages of the book dry and clean and keeping the binding intact, this bag goes that extra mile by having additional protective pockets to protect your other Bible study supplies. All of our products at Ministry Ideaz are high quality and designed to be both effective and efficient. This bag is no exception. The leather material is aesthetically pleasing and also water resistant to keep your book from enduring any water damage. You’ll be able to use this durable bag as more than just a book cover and treat it like a tote that is always ready to be on-the-go. Compared to other Bible bags and totes, our bag is available in a more stylish form. The beautiful soft leather case holds your Bible and complements both a casual and formal look. You can order this Bible tote bag in three different colors: midnight black, chocolate brown and tan “rustic” leather. The front of the bag has a beautiful golden belt lock on the front that lets you store your pens, papers and other items. The Bible bag has a zip-top closure and is lined with fabric in the interior. When you’ve finished with your study, simply zip up the bag and carry it home with the padded carrying handles or attach the cross-body strap to carry it on your shoulder. Our leather Bible bags allow you to customize them to best suit your style. Whether you’re looking for a Bible cover for yourself or as a gift idea for a Jehovah’s Witness friend, our leather Bible bag makes the perfect gift. Invest in a beautiful bag that will protect your precious book, helping it stay in mint condition for years and years to come. 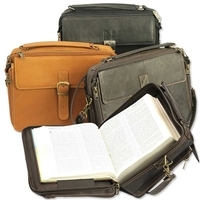 Order The Bookworm’s Leather Bible Bag for a great price and get free shipping on orders over $250!